Pioneers in the world of pearl jewelry, the designs of Mikimoto are revered for their grace, sophistication, and effortless elegance. Established in 1893, the designs of Mikimoto are meant to complement the natural sensuality of the modern woman and are handmade with the timeless jewelry making techniques, as well as with precious metals of the highest quality available. Finally available in the United States, the pearl-covered necklaces, earrings, bracelets, and fashion rings of Mikimoto make wonderful gifts for fashion-conscious loved ones – or even just for yourself – and are proudly on display now in the state-of-the-art Schenectady, Albany, and Glen Falls showrooms of Northeastern Fine Jewelry. Committed to the lifelong satisfaction of their beloved Capitol Region customers, Northeastern Fine Jewelry is proud offer an exclusive and totally authentic selection of the very best pearl-covered fashion jewelry items that the Japanese designers of Mikimoto have to offer. Firstly, available in a wide variety of strand and chain lengths, the necklaces of Mikimoto’s are made with 18-karat white, rose, and yellow gold, and can be found featuring bold gemstone embellishments that perfectly capture a fashion-forward feminine allure that is truly unforgettable. Further, also offered today at Northeastern Fine Jewelry are exquisite bracelets that epitomize Mikimoto’s spectacular pearl-inspired glitz, glamour, and style. In addition to these beautiful necklaces and bracelets, also available in the Schenectady, Glen Falls, and Albany locations of Northeastern Fine Jewelry is a plethora of Mikimoto genuine pearl earrings and fashion rings. Made with black and white pearls, the drop, stud, hoop, and huggie style earrings of Mikimoto are understated, demure, and look amazing when paired with any other Mikimoto pearl item. Finally, last but certainly not least, are the fashion rings of Mikimoto which are made with yellow gold, white gold, and platinum metals, all of which feature diamond and pearl-studded designs that are inspired by the hypnotizing and luxurious curves of nature. 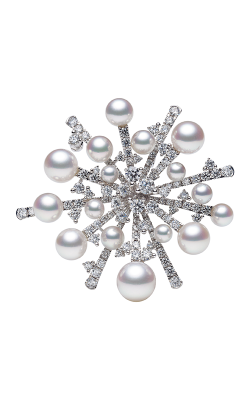 Much more than just the Japanese-made pearl jewelry of Mikimoto, Northeastern Fine Jewelry is New York’s leading source for the latest and greatest in contemporary bridal jewelry, fashion jewelry, and timepiece fashions. With three showrooms located in Schenectady, Albany, and Glen Falls, New York, the expert staff of Northeastern Fine Jewelry is prepared to assist all their customers with finding the perfect piece of authentic designer-made jewelry to bring a lifetime of enjoyment and wear. In addition to Mikimoto, NEFJ is also an authorized retailer of Tacori, Pandora, and Hearts on Fire, as well as offers an unbeatable selection of Swiss-made watches by Breitling, Longines, and many more.